After 3 years at Liverpool Ladies, Katrin Omarsdottir was one of a quartet to be released earlier today by the club along with Becky Easton, Ingrid Ryland and Line Smorsgard. 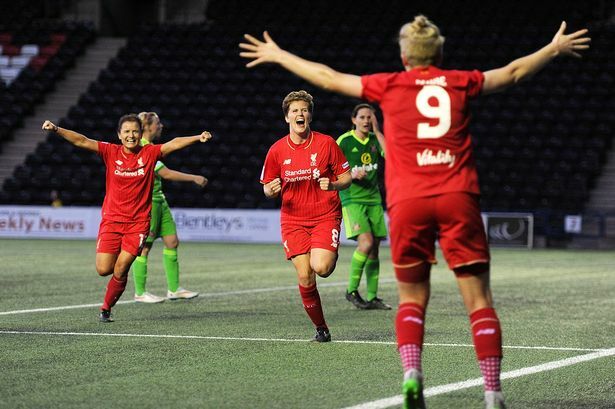 Like Easton, Katrin joined Liverpool as Matt Beard overhauled his starting 11 - signing in January 2013 - and formed a formidable partnership in the Reds midfield alongside Fara Williams. An excellent reader of the game and an imposing presence to have in the side, Katrin scored the goal that sealed Liverpool Ladies first league title after also scoring a rocket of a goal in the crucial 4-3 victory against Bristol Academy weeks earlier. The midfielder missed the first half of this season due to concussion, returning in July and scoring an important goal against Sunderland Ladies to book Liverpool's Continental Cup quarter-final spot. "As people are aware now I am leaving Liverpool. Scott and I spoke and we both came to the conclusion that the best thing for me at this moment in time is to leave Liverpool. Thinking of the past 3 years at the club is emotional. The support I've received from the staff and the players on the team has been immense. Being a part of this team is one of the best things that's happened to me. Matt has been great from day one and the staff around him. Kirsty, Kat, Pottsie, Scott and Luke. We all succeeded because we were one team and believed in each other. The character of this team is something I cherish, admire and will always remember. It's a group of people great at their profession and good people as well. I've built friendships for life and I am so proud to look back and see that we've won 2 championship titles in a row with no one expecting us to. Except us I guess. And our dedicated fans. But life goes on and you continue to develop and grow. I am excited for my next challenge and will look to build on the experiences I've had with Liverpool. I just want to thank our dedicated fans who have always been there and they will always have a place in my heart, and so does the club. I've been a Liverpool supporter since I was 5 and I will continue to be one for the rest of my life. Thank you Liverpool. You'll never walk alone." A classy statement from a classy player. I look forward to seeing where Katrin goes next and continuing to support her in her career. Best of luck! heather. Simple theme. Powered by Blogger.